Monday Monday! Hope yours is going well. 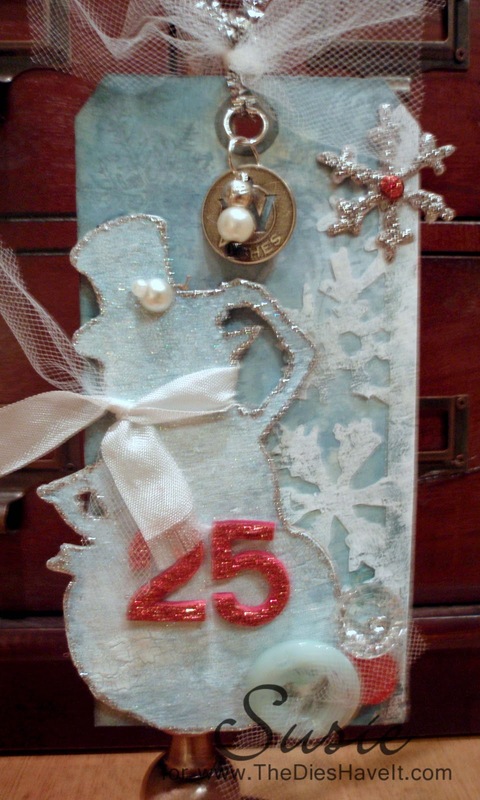 On today's tag, I used almost 100% of Tim Holtz' tag inspiration. The one thing I did change was that I added in some red. Red is my favorite color - yes - but I think it always looks good with this color blue. OK - busted - I think red looks good with everything! The tulle and the pearls on this tag just make me happy too. I was on tulle restriction when my daughter got married, so any time I can find an excuse to use it, I will. Red and tulle - what a great day! WOW!! What a GORGEOUS tag! The snowman is just adorable and I love all the extra's! Nice job!